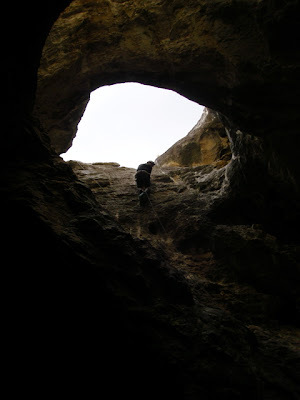 Over the weekend I went to Whipple Cave in the Egan Mountains of Nevada to teach a cave rescue class. 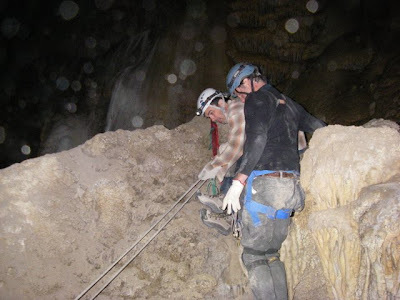 Earlier in the summer I went to Indiana to teach cave rescue as part of a National Cave Rescue Commission class. This class was on a much smaller scale, with members of the Southern Nevada Grotto and local firefighters attending. We reached the cave via a short trail and started practicing various techniques right at the entrance, where a 60-foot drop leads into the cave (you need at least 80 feet of rope, though, in order to reach the anchors). We were having record high temperatures this weekend, so about in the middle of the day we decided it was too hot to stay outside. 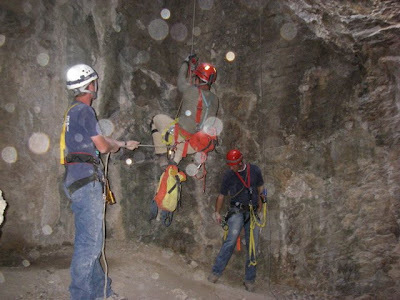 So we rappelled into the cave with enough gear to do our practice sessions inside the cave. 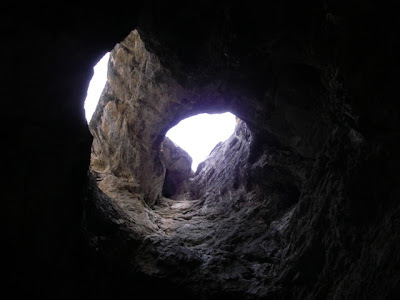 Here's the entrance of Whipple Cave looking up from the bottom of the pit. There are actually two holes, separated by a natural arch. 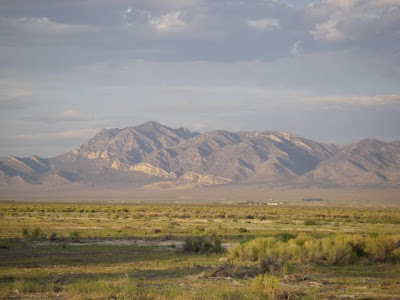 The rappel is mainly against the rock wall, except for the last fifteen feet, which is free. I didn't take all that many photos during the weekend because I was concentrating on what we were doing, but I did manage a few. 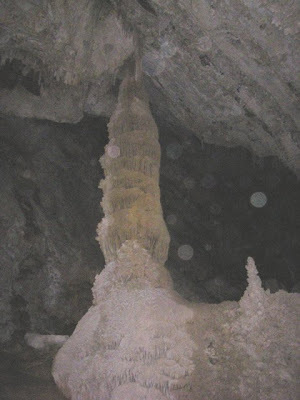 The outstanding feature in Whipple Cave is this enormous column near the back of the cave. 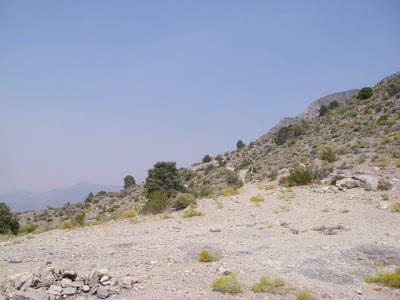 To get there you have to cross a boulder field and go through the keyhole, which involves squeezing through a hole and then jumping across a deep crack onto a boulder. We found several good pits right in that area to do some vertical practice. 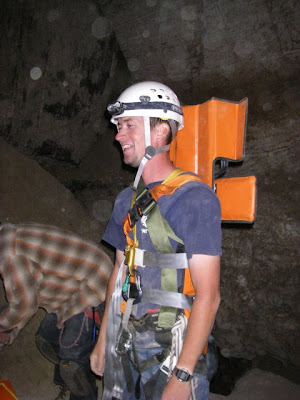 Here's Ben ready to haul our patient out of the pit. Bill and Tom are doing a safety check on the system. Micah sees that Ben is pulling plenty hard so he can just tend rope. And up comes our patient, enjoying the smooth ride. After we did a few practices, we took out the litter and backboard. Our cooperative patient even stood up and moved right where we wanted him with the Oregon Spine Splint attached. Then he got buckled into the Sked litter before taking a ride through the keyhole. Now we know we can do it--although it would be better to have a lot more people to help. 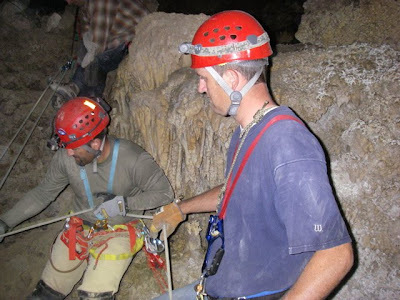 One thing that became apparent during all the practice was that if someone got hurt at the back of the cave, it would take a lot of people--15 to 20 would be nice--to get a patient out in a reasonable amount of time (8-10 hours). 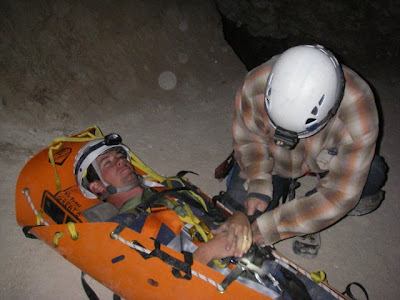 I always recommend that people who go caving take at least a basic rescue class. It certainly makes you cave a little safer if you realize what it will take to get you out of a cave if you get hurt. Back at the entrance we climbed out of the cave, packed up gear, and headed home or to a campsite for the night. The next morning we got back together and reviewed what we had done the day before. I challenged the class to set up a haul/lower system, belay, and attendant line in 20 minutes at the cave entrance. They managed to do it in about 30 minutes. Then we went on to practice counterbalances and some basic rope climbing skills down in the cave. 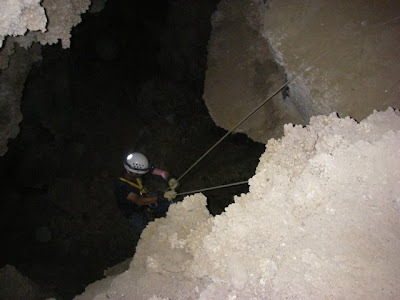 Another group was visiting the cave, so we had to use some different anchors than we had the day before. We found that one worked better for doing a haul, so it was good to be forced to think outside the box. The other group had started climbing out before we did, but they were using some primitive climbing gear, so it didn't take long for our group to pass them. We had nearly all the gear put away and were getting ready to go back to the trucks when we heard a call for help from down in the pit. One of the guys had climbed a few feet off the ground, but he couldn't go up or down and was exhausted. At first we thought it was a joke, but when we took a better look at him, we realized he was seriously stuck. He was drenched in sweat and so tired he couldn't help himself at all. He had a buddy down below him, and their wives and kids were up near the top. They wanted the wives and kids to start pulling on the rope to help him get up. We said we would be happy to assist, and quickly rigged up a haul system, and created a belay and edge attendant lines. Earlier in the day it had taken 30 minutes to do this. Now, after a little more practice and in a for real situation, it only took about 10 minutes. Ten minutes later we had the man out of the pit. I'm glad it all turned out well. I don't think the man will be rappelling into another cave anytime soon--or anytime again for that matter. He was quite spooked by the incident, and he realized that if we weren't there he could have been in serious trouble. It's very dangerous to dangle in a harness because you start losing circulation to your legs, and that can lead to life-threatening injuries. We all learned a lot during the weekend, too. This was a sharp class, and they learned fast. Now we need to keep practicing those skills so we stay fresh and ready for the next incident. You've scared me enough that I won't try repelling in a cave either. 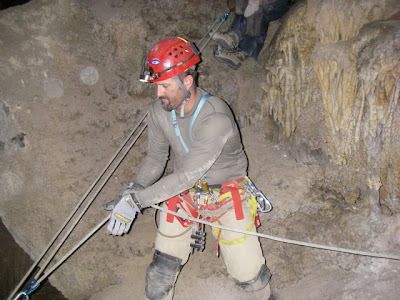 Sometimes you hear about a cave rescue on the news, but they don't tell you that it took 8-10 hours! How awesome that you guys were there to help! Woot! !